We are literate. But do we know our literature? That question would not perturb the mind of the average Malayali. The distance between literature and the literate is easily traversed in this coastal state, what with more than half a dozen literary weeklies being published, not to mention fortnightlies and special issues. This was further reinforced when I recently participated in the Kerala Lit Fest in Kozhikode. I had the opportunity to participate in it two years ago. This time, I was overwhelmed by the way it has grown to become one of the most important lit fests in the country. According to the organisers, it is “the grandest celebration of words, stories, and ideas”, and the “second largest cultural gathering in the country”. I could not agree more. The humble Ravi Deecee, chief facilitator of the Kerala Lit Fest, whispered in my ear that the Kochi-Muziris Biennale was his inspiration. It made me wonder if the ‘People’s Biennale’ in Kochi was the biggest cultural gathering in the country. The jury is still out. A couple of years ago, I had visited the Zee Jaipur Literature Festival. It was overcrowded with celebrities and corporate support and appeared to be more like a jamboree of bigwigs than a place where ideas and thoughts were exchanged. I was completely disillusioned by the experience and I began thinking: Is this where literature is at? Today there are a number of lit fests from Mumbai to Kolkata, Hyderabad and Bengaluru to the ‘Ka’Lit Fest in Thiruvananthapuram. Yet, Kozhikode to me seemed to be beating other lit fests all ends up when it came to the participation of the youth and local residents. Other lit fests are mostly high-brow affairs where the elite gather to get a fair degree of literary jollies. What added more colour to the Kerala Lit Fest was its location—the Kozhikode beach. The venues were also equally enticing: Ezhuthola, Aksharam, Thulika, Vaakku and a special venue, Vellithira, to screen films. 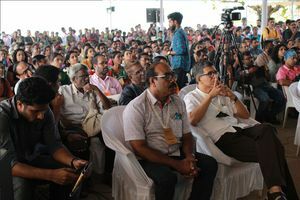 The Kerala Literature Festival, 2019, saw a massive turnout of 2.6 lakh people attending various sessions conducted by around 500 guest speakers and authors. The topics covered were invigorating to say the least—everything from Sabarimala and women empowerment to literature and rebuilding Kerala after the floods. I returned with a lingering thought that writers are at the shy end of the spectrum—silent watchers of life rather than noisy graspers of it. It is such thronging crowds that allow them to be in zones where they can speak their minds. In that respect, the Kerala Lit Fest will be marked in the sands of time. It takes a city to organise a festival like KLF. Speaking of which, I must say that my mental floss about KLF was soon cleaned out by the event that the Kochi Biennale Foundation was about to host: the first ever contemporary art auction in Kochi. But by the night of January 18, when the auction was about to conclude, all my apprehensions vanished, because most of the bidders were young people from Kerala. They had no inhibitions in putting their money where their heart was—the art works on sale. Such confidence would go a long way towards encouraging the young artists whose works were among the ones auctioned. KLF and KBF’s auction for flood relief are to quote American author Thomas Pynchon: “I don’t believe in any of it, Ode”.